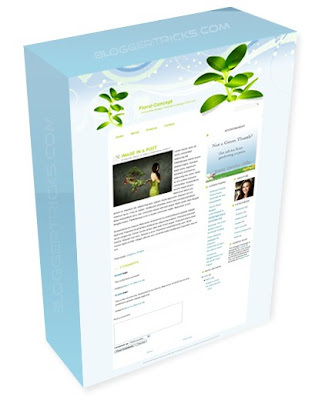 Bringing you all BloggerTricks.com readers another lovely 3 Column Blogger Template "Floral Concept". Floral Concept was originally a Wordpress theme by Wordpressthemepark.com and I converted this beautiful template to Blogger version. The template comes with so many features including 3 columns, embedded comment form below post, Google adsense ready,etc..
1. First Follow the basic installation steps here. and replace the links for your interest. Suppose if you want to link to Google, Yahoo and Blogger.. the code should be..
That's it! Now your template is successfully installed! Yeah I'have been the first visitor in this tutorial ! He that is a beautiful template ! yes,,it's really beautiful templates,but i can't change the banner.